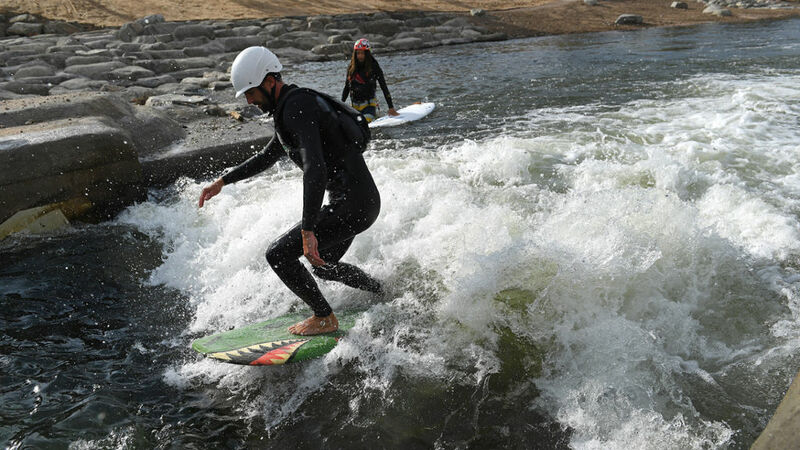 River Run Park is a brand new pair of river surfing waves on the South Platte near the Broken Tee Golf Course in south Denver. The upper wave (Benihanas) is a high-speed, dynamic wave that gives up great rides but can be challenging to surf for beginners. Once you have it dialed though, it may be the highest-performance wave in the state. It features a wave shaper – a set of three adjustable plates underneath the water that allow the wave to be dialed for particular flows. At higher flows (from 250 cfs to over 750 cfs) the wave creates a large A-Frame wave that can run from waist to chest high. Given the high water speed, some surfers have been having success with wakesurf boards and other short craft. The lower wave (Chiclets) is a friendlier beginner wave/hole. Changes in May 2017 have transformed the feature from a fairly flat wave/hole to a taller wave with a small green face. In Spring 2017 the wave saw its first season of spring runoff, and we still have yet to see flows too high for a surfable wave, though the flows that year were not particularly high. Shaped appropriately, at 500-750 cfs it’s still good to go, with a high, big-shouldered v-wave. As of this writing, the highest sustained flows the park has seen since its creation have been in the range of 750 cfs, and the wave has been outstanding at those flows. Higher sustained flows (as opposed to rain spikes) are possible on the South Platte, and it remains to be seen how the wave will perform at over 1,000 – if at all. The first season was enough to develop some general etiquette rules and suggestions; you can find those here. Shorter is generally better on the upper wave. Particularly at lower flows, the wave trough is so steep that it can be difficult to ride a longer (over 5’6″ or so) board, but at higher flows the angles are softer and you can surf a larger variety of craft. The Scott Burke 5’2″ Fish (link, review) is a popular choice. So are wakesurf boards like the Slingshot Alien Twister or Ankle Biter. Short black-ball beaters or other short, thick ocean boards like the Catch Surf Beater are also pretty common. I’ve enjoyed my Flying Pig quite a bit. On the lower wave, more volume is usually better, and longboards or high-volume hybrids do well. The South Platte Below Union gives the best gauge here; look for 175+ cfs for the upper wave, and over 200 or 250 gives a much better opportunity for longer, more dynamic rides. Tuned right, it remains in great shape up to 750 cfs, and likely higher. In its earlier form, the lower wave could be surfed on a paddleboard all the way down to 60 cfs, but improvements at 130 cfs and above have led it to green out at low flows. You can also get a peek at what’s coming down from Chatfield by keeping an eye on the Chatfield Outflow gauge. Changes will take 2-3 hours to reach RRP. The park shares a parking lot with the Broken Tee Golf Course; just park as close as you can to the river.